The most popular option for furnaces in homes today is the natural gas furnace. Gas-powered furnaces are economical to run and provide fast and effective heating throughout a home. However, electric furnaces are also common, and they offer some important advantages. Since they do not require a gas line, they can work in any home. For smaller houses, they provide the right amount of heat at high efficiency levels. They are also safer than gas furnaces since they don’t use combustible gas. Electric furnaces can malfunction, just like any machine, but repairing them is usually a simple task for an expert technician. 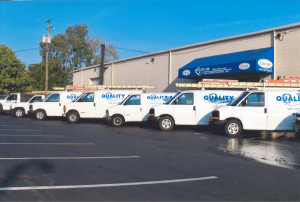 If you need heating repair in Columbus, OH to restore your electric furnace, call Quality Air Heating and Air Conditioning, where we’ve serviced electric furnaces for many years. Replacing failed heating elements: The heating elements are the heart of an electric furnace. These sets of coils heat up as current flows through them, and this heat transfers to the air that will circulate through the ducts. A furnace will have more than one heating element; the more heat the thermostat requires, the more heating elements will activate. If a heating element fails, the furnace’s effectiveness will drop. A professional can remove the broken element and replace it with a new one. Fixing broken relays: Relays send electrical power to components like the heating elements and the motors. Faulty relays are a common reason for problems like the blower running continually or the heating elements refusing to come on. Repairing the blower motor: The blower is responsible for taking the heated air from the cabinet and sending it through the ducts to the vents. The motor that powers the blower can suffer from wear and tear and eventually burn out, especially if it doesn’t receive regular maintenance. Although sometimes the blower motor must be replaced entirely, often technicians will only need to unclog debris from the motor or adjust the fan belt to restore it. You should never attempt repairs to heating elements, electrical connections, relays, the transformer, or any of the other electrical components inside a furnace. These tasks require special training and tools, and you risk damaging the furnace further with amateur work. There is also a small, yet still present, chance of a high voltage shock. For proper and effective heating repair in Columbus, OH for your electric furnace, you can rely on Quality Air Heating and Air Conditioning. Call us today to schedule service!